Perfect for upgrading your sharpening system or replacing used stones. 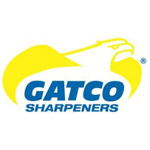 Can be used with all GATCO® sharpening systems. All accessory hones contain our patent pending adjustable sliding guide rod and finger protection rails.